Thank you so much for helping us test our new battle mode! We DO read your feedback, and we’re fixing up the mode. We really needed a large-scale test of the system (as fun as it was for the four of us, we don’t represent the game at large), so thank you! 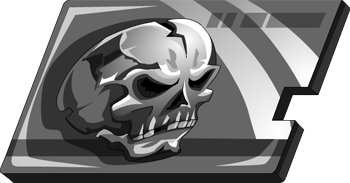 As a reward, all of the players who help test the feature by purchasing a Gold Skull Card during this week will receive the super-rare Battle Tested Achievement! Good news for rare hunters too: the Gold Skull Card is going to be marked as “RARE” and will increase your rarity score. The Battle Tested (1600 RP) and Juggernaut (2000 RP) Achievements! Since it’s not entirely fair to let Varium players have all the fun, we’re opening up Juggernaut mode to Credit players too, with the NEW Silver Skull Card. Now, for a number of Credits, ANYONE over level 20 will be able to play this unique battle mode... from the other side! MWAHAHAHA! *cough* Sorry about that. As with ANYTHING new, there’s bound to be problems, and Titan’s been hard at work to fix them all for you! Starting with this update, you’ll be able to see your Juggernaut record on your stats page. Addtionally, many of the glitches with creating a Juggernaut battle have been fixed. We’ve also fixed the damage issue with low percentage hits. You may have noticed that sometimes moves like Cheap Shot, Berzerker, or Rage attacks were showing damage along the lines of 0-2-1 or other very low damage markers. Well, no longer will you hit for 0 damage! In addition, a lot of you have been complaining about the level range for Juggernaut battle. Originally, how we’d set it up was the Juggernaut’s level, subtract 9 and then add or subtract 2 to that, and that’s how you’d match other players. But, that didn’t present enough of a challenge for the Juggernaut, and serves to discourage lower-level players from playing team battles. We’re altering the matching system to increase the level of the Juggernaut underdog by 2 and increase the range by 1. So now, instead of a level 33 Juggernaut facing two players from 22-26 the Juggernaut will face two players in the 23-28 range, which should solve this problem. Some of our players have suggested a weapon that has a unique battle move, and we thought that idea was really cool! 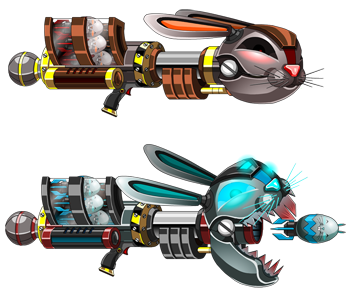 So, after sending those adorable bunnies back to their little hutches, we’ll be introducing the promotional Stun Cannon and Stun Blaster with a 5% chance to stun! 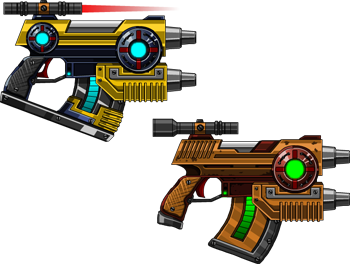 These beasty and beautiful sidearms will be available as soon as go live with the update with purchase of the $50 varium package! 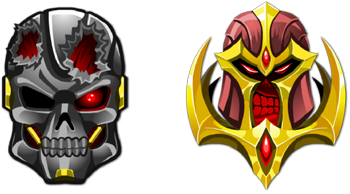 To accomodate for the greater opportunity to stun available to all players who own these guns, we have complely removed the defense reduction on stunned players (previously -15%). Also, the stun chance on the gun will not be affected by Shadow Arts.